There are countless "as-a-Service" offerings on the market today, and typically they live in the cloud. Back in 2014, startup BlueData blazed a different trail by launching its EPIC Enterprise big-data-as-a-service offering on-premises instead. On Wednesday, BlueData announced that the software can now run on Amazon Web Services (AWS) and other public clouds, making it the first BDaaS platform to work both ways, the company says. BlueData's EPIC (short for "Elastic Private Instant Clusters") platform taps embedded Docker container technology to let businesses spin up virtual Hadoop or Spark clusters within minutes on their existing infrastructure, the company says, giving data scientists on-demand access to the applications, data, and infrastructure. BlueData has offered a free community edition of BlueData EPIC running on AWS since last year, but until now the enterprise edition was available only for on-premises deployments. With the new flexibility to run in hybrid and multicloud environments, customers can eliminate data movement by keeping data on-premises while running compute in the cloud. At the same time, there's a "single pane of glass" for creating and managing big-data environments, BlueData says. The Docker images for Hadoop, Spark, and other big data applications will be the same regardless of the underlying infrastructure or cloud service. As of Wednesday there's limited availability on AWS, with general availability there -– as well as on Microsoft Azure, Google Cloud Platform, and other public cloud services -– due in the coming months. Pricing on the public cloud will include usage-based and annual subscription options. 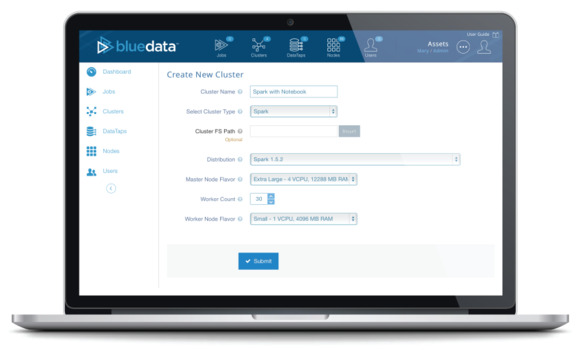 Also on Wednesday, BlueData introduced the summer release of its EPIC platform. With roots at VMware, BlueData last year forged a partnership with Intel and announced a fresh $20 million in funding. The BDaaS market is expected to be worth $7 billion by 2020, according to research firm MarketsandMarkets.